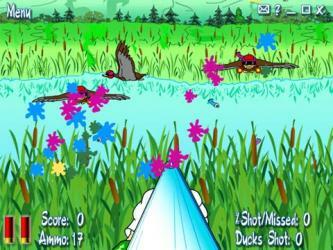 Charge your rifle and stand out against the hunting ducks! Incredible arcade-shooter mix on your Symbian phone! treat for fans of trendy cartoon graphics and classic shooter-arcade mix. The task of the hunter ... oops! sorry ... the player is simple: kill as many ducks as possible. But beware - those creatures, first of all, do not fly unprotected (use helmets! ), and, second, shoot right at you. So, charge your rifle and stand out against the... Jet Ducks! Symbian hunting game for the Series 60 Platform.